Sailing the Bahamas could take a lifetime to see all that the 700+ islands have to offer. Whether you set out to explore on your own with a bareboat catamaran charter or treat yourself to an affordable, all-inclusive crewed catamaran charter, we offer these suggestions to help you plan a memorable sailing vacation. You charter base in the Bahamas is The Abacos on Great Abaco Island in Marsh Harbour. You can spend your entire vacation exploring The Abacos. Snorkel, dive the marine park, fish, visit the Hopetown Lighthouse, watch the boat builders of Man-o-War Cay, chill on one of the incredible beaches of Great Guana or Treasure Cay, or wet your whistle in a beach bar. We can tell you a lot more about this area, so just ask, but we would like to share a few other highlights that you will not want to miss on this sailing vacation you are planning or perhaps one of the next two! The 365 islands and cays that comprise the Exumas offer enough pristine beaches, crystalline waters, and abundant sea-life for your entire sailing vacation. The long chain of dotted land masses starts just beyond Nassau. One of the most famous are the swimming pigs that live on Major’s Spot Key (video at top right). Here are a few other Exumas highlights. The Exuma Cays Sea Park is the first marine-protected area of its kind in the Caribbean. You can thank the Bahamas National Trust for the preservation of this amazing ecosystem. Visiting this sea park is one time when you don’t want to anchor far and away to preserve your privacy. You will definitely want to pick up a mooring ball at a nominal fee to easily enjoy all that the park has to offer. Plus, you will sleep much better protected from the rolling waves and occasional wind event. We recommend trying to snag a ball at the Warderick Wells field. There is plenty to do and see such as amazing snorkeling right off your boat and hiking trails that have just as much interesting wildlife and entertaining blow holes. Don’t miss Boo Boo Hill Trail, the highest point on the island, and remember to take your own driftwood memento to leave behind at the top. Especially if you were not lucky enough to glimpse the few stromatolite formations in the Exuma Cays Sea Park, sail to the southern end of the Exumas chain of islands. Near Georgetown along Stocking Island, Lee Stocking Island, Highbourne Cay, and Little Darby Island you will see these intriguing formations. 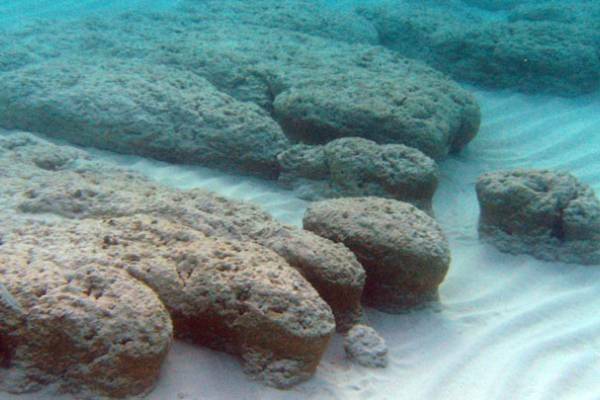 Where reefs are made by coral, these shallow water structures are built by bacteria. Tip: On your way south from the Park, drop in on Lorraine’s Cafe on Great Guana Cay for a heaping portion of Bahamian cooking, some of her mom’s homemade bread, and elusive good internet connection. Dean’s Blue Hole is a mesmerizingly blue aperture encircled y azure water and white sand. 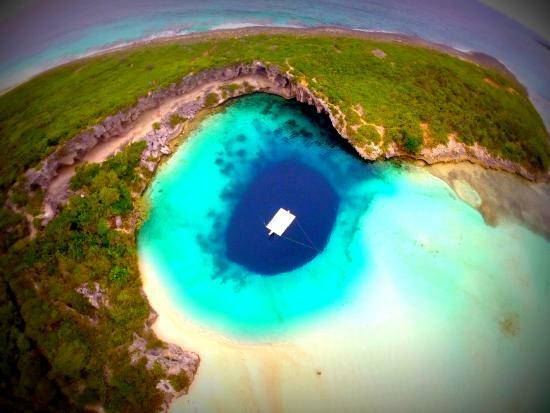 Its beauty is only surpassed by its shocking depth of 663′ which is almost twice as deep as other know blue holes on our planet. Starkly contrasting coastlines flank a towering spine of ancient reef. On the east side, imposing cliffs and caves bear the brunt of the Atlantic Ocean’s pounding waves. On the west side, you will find sandy slopes bordered by the calm, shallow waters of the Bahamas Bank. Hamilton’s Cave is one of the largest caves in The Bahamas. Lucayan Indians left behind artifacts and cave drawings for you to discover. Closer to your start at The Abacos is Eleuthera. The pink sand beaches are reason enough to stop off for a snorkel and swim. But you’ll find more than tropical beaches like quaint New England architecture, local bars abuzz with live music, beer, and rum, and even self-proclaimed “sweetest pineapple on earth”. Our Bahama sailing suggestions will take more than a week….and the Bahamas in their entirety could take a lifetime! So plan a catamaran charter soon to get started.